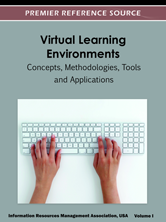 Virtual Learning Environments: Concepts, Methodologies, Tools and Applications is a three volume compendium of the latest research, case studies, theories, and methodologies within the field of virtual learning environments. As networks get faster, cheaper, safer, and more reliable, their applications grow at a rate that makes it difficult for the typical practitioner to keep abreast. With a wide range of subjects, spanning from authors across the globe and with applications at different levels of education and higher learning, this reference guide serves academics and practitioners alike, indexed and categorized easily for study and application.